GOES satellite view of Tomas on 3 November 2010 at 1015 EST showing a disorganized storm with a poorly defined center of ciruclation and strong convection to the east. 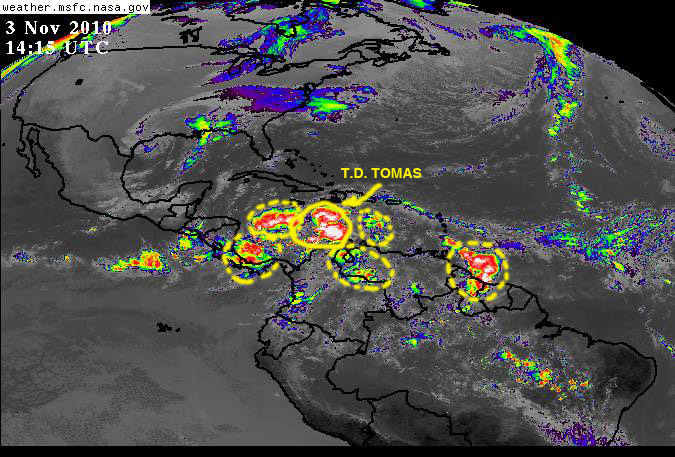 The large cloudy area on the left is actually part of a large cluster of rain cells in which Tomas is now embedded. Tropical cyclone Tomas has encountered a rather complex atmospheric environment where numerous external factors are affecting the system, to the point where its survival as a viable tropical cyclone is doubtful. In the morning of 3 November 2010 Tomas is a tropical depression, quite disorganized, moving northwest with sustained winds of 30 mph. The cold front descending over the southeastern USA and the Gulf should continue to force the system to recurve toward the north and then the northeast, but the forecast models are quite divided as to what will exactly happen in 72-96 hours from now both with respect to the future track and intensity of this storm. Infrared satellite view of the Caribbean basin on 3 November 2010 at 1015 EST showing tropical depression Tomas embedded within a large elongated cluster of storm cells over Central America, Panama and northern Colombia and Venezuela. Part of the problem with forecasting what will happen with Tomas is the large uncertainty that exists regarding whether Tomas will recover from its current state of disorganization and ever regain tropical cyclone strength or not. For the time being Tomas has become embedded in a rather large cluster of rain/storm cells extending from the eastern Pacific off the coast of Central America to the central Caribbean and north of Panama, in a sense Tomas has almost become just one more rather large and strong convective cell within the larger cluster. This current condition generates much uncertainty with respect to data needed to feed the forecast models, consequently the forecasts themselves become rather erratic or at the very least, uncertain. Projected track for Tomas developed by the Navy Research Laboratory, based on NOAA observations and data, showing the cyclone as it has started moving toward the northwest in the first phase of what is forecast as a recurving motion toward the north and then the northeast. One model has Tomas stalling between Cuba, Jamaica and Hispaniola, other models see some re-strengthening of the storm and it re-curves northeastward, yet another model predicts Tomas will go back toward the northwest once it is over the Atlantic east of the Bahamas. The only aspect of the cyclone over which there is little uncertainty is that as it re-curves and gets closer to Hispaniola the potential for large amounts of rain over Haiti and the Dominican Republic and eastern Cuba appear to be high, this in turn raises the potential for flash floods and mud slides that could cause widespread damage in certain areas. Given the large number of still homeless population victim of the earthquake in Haiti, who are living in makeshift shelters and camps, we may have a potential human disaster in the making. Clearly, emergency plans and preparedness actions need to be activated in these vulnerable communities. Composite of several satellite views on 3 November 2010 to create a global mosaic showing the eastern Pacific, Caribbean, Atlantic, and Indian Ocean basins as well as equatorial Africa. This view shows water vapor in the atmpshere, which hels visualize the various atmospheric features interacting with Tomas and affecting its organization, intensity and track. 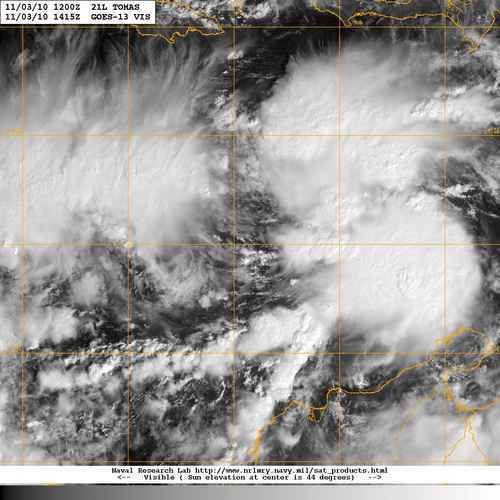 Elsewhere in the Atlantic basin there is an area of disturbed weather off the coast of Venezuela and Guyana in just about the same region that the tropical wave that generated Tomas was some ten days ago. There is also a large elongated cluster of rain/storm cells toward the eastern end of Hurricane Alley, which may warrant monitoring in days to come. Color-enhanced infrared GOES satellite view of the larger Caribbean basin on 3 November 2010 at 0945 EST. The cluster of convective cells over Central America, the Caribbean and nortern Colombia and Venezuela is clearly visible. 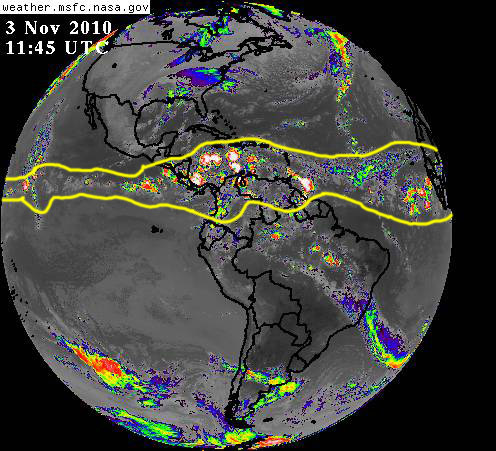 The Caribbean basin, especially from Nicaragua through Panama, and northern Colombia and Venezuela appear to be embedded in rain and storm cells, which have already caused torrential rains in Nicaragua, Costa Rica and Panama, a condition that may persist for some time. Full-disk satellite view of Earth's western hemisphere on 3 November 2010. 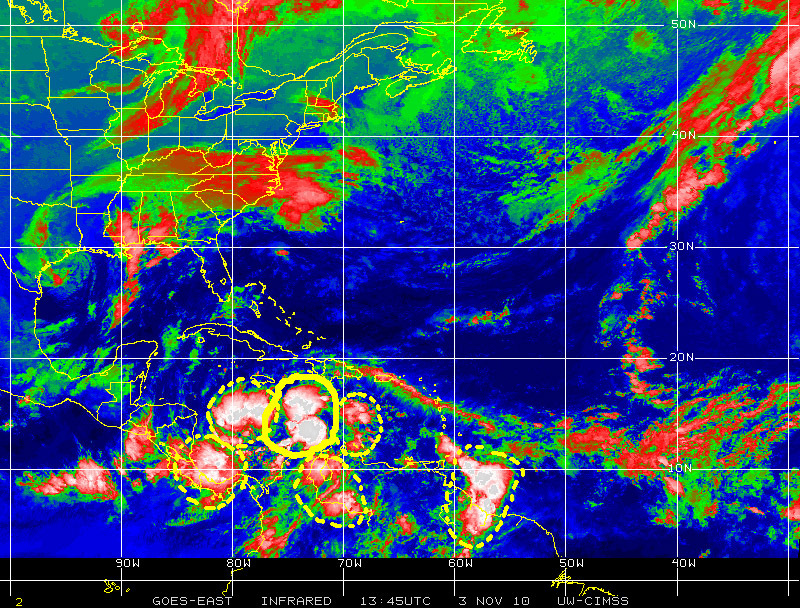 Outlined in yellow is the belt of tropical activity still circling the globe just north of the equator.